A native of Long Island, New York, Stephanie Patterson began playing the oboe at age 7. 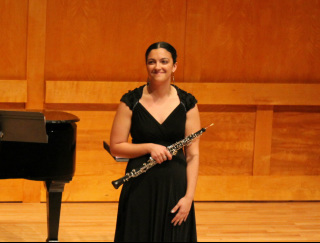 She holds a Master’s of Music Degree in oboe performance from Stony Brook University and a B.M. in Music Education from SUNY Fredonia, where she was awarded a prestigious Performer’s Certificate, and won the Woodwind Area Concerto Competition. A certified New York State educator, Stephanie is an active private instructor. Stephanie currently resides in Fort Wayne, Indiana, works as an oboe tuner and adjuster at Fox Products, is the principal oboist for the Symphony of the Lakes in Warsaw, IN, and is a contributing musician with the Fort Wayne Philharmonic. Professionally, Stephanie has played with numerous ensembles including the American Wind Symphony Orchestra, the Nassau Pops, the Western New York Chamber Orchestra, the Erie Chamber Orchestra, the Southern Tier Symphony and the Westchester Band. Stephanie also performed at a number of churches on Long Island and in Manhattan, and also performed in pits for musicals with theatre companies in Westchester and on Long Island. Stephanie has also worked in the world of film, acting as an “on-screen” oboist in the 2014 remake of “Annie." Her principal teachers include Pedro Diaz, Mark Dubois, Sarah Hamilton and Alan Hollander.